Algiers is a dangerous place. My colleagues, Pat and Alistair had volunteered for a site visit with our client.In the week they had spent there a police training academy, very close to our accommodation, had been attacked by Al Qaeda insurgents in an attempt to destabilise the current Prime Minister's leadership. 40 young police cadets had died in that attack. As a team we seriously reviewed our commitment to this opportunity to influence the regeneration of one of the worldÕs most beautiful cities. The more research we undertook the more fascinated by the place we became. The view in the studio was that we could do good work which would involve us working potentially with UNESCO, and that it was in fact initiatives like these which helped emergent nations achieve stability, inward investment and international support. This sounds pompous and condescending, but we had a choice and we genuinely felt that we could help the Algerians articulate their vision for Algiers. Let me rewind however to establish the exact project context. RMJM was asked to consider a significant master planning opportunity for the City of Algiers ,the capital of Algeria in North Africa. The project was introduced to our Scottish team at RMJM by colleagues from our Abu Dhabi office. Our office there had been working with a sovereign wealth development company called Sorouh, a major client who has transformational wealth, great political connections and access to significant finance. In discussion with our Middle East team it made sense for these North African opportunities to be design led from the UK - given that we were considerably closer in geographic terms, that our Abu Dhabi and Dubai Offices were already extremely busy, and that we also had some recent experience working in this area of Africa, namely in Libya and Morocco. In reality though, Algiers, although close to Libya and Morocco, was vastly different from what we had expected. The Algerian Government had been in discussion with the Crown Prince of Abu Dhabi on a number of major infrastructure and investment opportunities across the Country. Algeria has significant natural resources being one of AfricaÕs largest countries, whereas Abu Dhabi had the financial liquidity and project management capabilities to assist. It is worth noting that, quite literally from the dawn of civilisation, Algiers has been of continual political importance as the principle gateway to Africa from Europe. From the earliest times of the Phoenicians who terrorised the Mediterranean (pre Roman times) from Istanbul to Marrakesh, the city has had strategic importance controlling trade between continents. So confusing was our reading of Algiers' colourful past we were required to construct a timeline detailing who over the country's history controlled the capital city (see diagram included). Like an archaeologist, we wanted to understand the historical layering of Algiers' architecture, from its medieval Casbah origins through to its French occupation through the 19th and early 20th Century. We decided that one of the desired outcomes from our design development studies for the new waterfront for the historic city of Algiers was a record of our historical investigations. We created a journal that was a document not requested by our client group but one that we felt would demonstrate the depth of our study and our appreciation of the cityÕs incredible history. The document proved to be hugely successful for the simple reason that nothing like it appeared to exist. The Minister of Tourism for Algiers was especially impressed and asked us for 100 more copies for his personal use. It is really hard to appreciate unless you experience first hand the complete lack of cultural infrastructure and historical record. Algiers is a city that barely copes with the present where basic matters of health and welfare are people's immediate priorities. The poverty and living conditions of most of the Algiers population is borderline. Imagine collaging Beaux Art Paris with medieval Damascus, the oldest inhabited city in the world. Quadruple the population, paint everything white, increase the number of cars tenfold and put it all on a steep hill looking over the Mediterranean and you begin to get a picture of the city! With embedded fragments of Roman ruins to highly decorative and classically ornate opera houses built by the French at the turn of the century, the city is architecturally outstanding. It is incredible to think that this 'world city' has been effectively lost to the world since the 1950s when the Algerians overthrew French rule in a bloody war to declare independence. Algeria is slowly opening up and our project for a new accessible waterfront for its prize capital city is one important part of this process. Given that Algiers is a short ferry ride from Ibiza, EuropeÕs Club Mecca for the 24/7 party experience, or that on the other side of the Med, you have easily accessible destinations like Cannes, Monaco, Split, Marseille and Barcelona to name but a few, you begin to realise that the whole North African cost has spectacular potential for considered development. Historic Algiers is presently dysfunctional, beautiful but thoroughly compromised by everyday pressures. The city is inaccessible to visitors and barely supports day to day life for its own citizens. The Algerian Government and the city mayor have, however, imaginatively realised its potential and are trying their best to stimulate urban solutions to improve the city's prospects. Our study focussed on the waterfront that links the whole city around a dramatic 27km bay. The important historic city is located on the very tip of the most western promontory where the city effectively established itself as a harbour around which a walled city grew. The original walled city founded on the ruins of a former Roman settlement commands an impressive position. This early walled city becoming the Casbah which is still very much a living city quarter today. 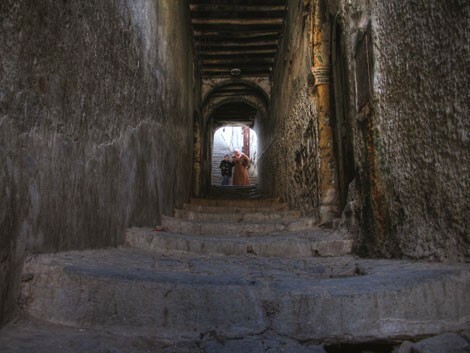 Most travel guides warn you however, not to enter the Casbah as it is effectively a dangerous labyrinth slum where visitors risk their life entering for fear of being robbed and mugged. Our team did, however, get access to the city although only in the company of our armed guards (large suited Arab chaps with serious moustaches and handguns). The principle reason for understanding the qualities of the Casbah was to consider how we might surgically open up the Casbah area and link it back to its waterfront.The French effectively overlaid a massive architectural edifice and colonnaded superstructure in front of the old town not only to control trade but also to wall in the indigenous population. Like, for example, EdinburghÕs significant sub structures in the Canongate that were built over the slums to allow bridges like George IV Bridge to better link Edinburgh. There is too much to cover to fully explain how Algiers has developed over time. The following covers some of our research that ultimately influenced our developing design studies. Algiers Historic Timeline: A means to understand the sediments of time. 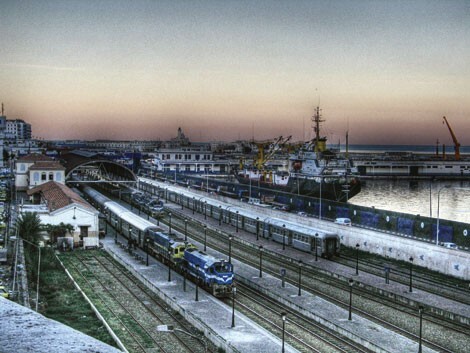 Algiers relation with the sea: Critically the shape and form of the city has been significantly influenced by trade and access to the sea and to Africa's interior. The Historic Casbah: The romantic intensity of the Casbah and its astonishing history of occupation. The Casbah today: Real life in the Casbah today is not romantic. The sheer density of people in such a relatively small area is incredible. 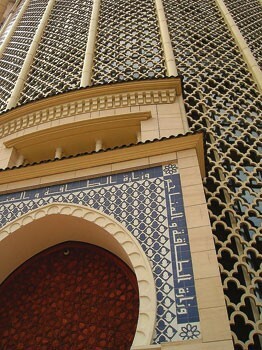 The Ottoman Empire: Arabic and Turkish influences are wholly evident within the City's historic architecture. The Spanish Influence: Prior to the French, the Spanish had a period of power and rule in Algiers and they also left a legacy of Moorish architecture. French Colonial Algiers: By far the most dramatic historical overlay, French colonial urban architecture radically transplanted itself over the existing topography to dominate and control the indigenous city. Looking beyond the glorious architecture of the city we also tried to understand the cultural and social factors that shaped the context and the values of modern Algiers. It is clear that one of the most difficult and recent historical events which continues to affect peoples lives is the Algerian war for independence between 1954 and 1962. The relationship between the French and the Algerians is complex. The French were reported to have murdered many Algerians during this period in an attempt to quell the uprising. The French actions caused an outcry across the international community, yet today Algerians continue to speak French and still have very strong relations with France. In 1962 the huge French population of Algiers simply got up and left. All of them! The city experienced a mass exodus and the city which the French had fashionably built as an outpost of Paris was vacated. The concert halls, the elegant Hausmen apartment buildings, the arcades, the beaux art gardens and sculpture was all left to the people of Algiers. The defeated French lost everything that generations of rule had achieved. The city of Algiers right here and right now is exactly as it was left then, more tired and flaky, but the same. A spectacular time capsule of a bygone age where French poets, artists, aristocrats, merchants, shopkeepers, explorers, entrepreneurs and soldiers all enjoyed an indulgent life on the Mediterranean, with gardens and fountains and servants to tend. Algiers 'the white city' is breathtaking architecturally. However, it is the people and the volume of people that inhabit the city that is staggering. Elegant apartments built for the rich French now house extended families of Algerians: a family per room all externalising their colourful washing on the decorative ironwork balustrades common to every window. Like a street in Paris transformed as if in Glasgow's Gorbals in the 50s on a sunny day, the place is alive with everyday events. People talking, children playing, shopping its all here. The clear opportunity that we identified which would have the greatest impact on the citizens of AlgiersÕ enjoyment of their city was to give them back their waterfront. 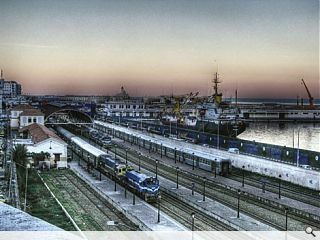 Such a simple idea, but a major infrastructural challenge providing a new sea park and broadwalk that reclaimed the waterfront from its current shabby industrial usage, from the existing railway and from the many small factory fishing boats. The opportunity to open up the most incredible colonnaded architecture which stretches for what seems like miles for all manner of creative uses excited the hell out of us. The grand colonnades are a remarkable architectural feature, some rising to 4 and 5 storeys and repeated for hundreds of metres. The detailing of the public realm is, for example, as fanciful as the buildings, confirming the scale of the French investment and vison at the time. The opportunity for the re-use of redundant space, creating green spaces and introducing a whole spectrum of activities that would benefit the city was enormous. The provision of modern office space, to high end residential (both of which are non-existent) to cultural uses, to a new convention centre and a ferry terminal were all activities that we proposed in our master plan. From a townscape perspective we reviewed the scale of development and understood the new architecture to be generally 6 Ð 7 storeys to tie into the classical apartment buildings. The site, however, was multi-levelled and it helped us to build a complete 3D model of the city together with numerous physical models to develop our response. The view landside looking from the waters edge back to the city required to be composed and theatrically layered like the city itself. Points of connection were obvious, notably where the city opened up to frame a cascading park, the parks helping to define different city parts. The opportunity to link under roads and exploit the site levels was also interesting again like Edinburgh's vennel-like spaces we could connect pedestrians in unusual ways to link and open the city to the sea. We proposed a new urban architecture that would develop in response to important views and vistas and in relation to the cityÕs skewed grids and existing block structure. One primary design move that we developed in consultation with Sorouh and the Algerians was to directly connect the square that surrounded the historic fisherman's mosque, a historic site with both political and religious significance. This square is an important public space that sits at the bottom of the Casbah. The square is always full of people; therefore, the possibility of creating a new physical link from this space to the water was important. We managed to cut the square at one end, the end the French had overlaid to reveal a new stepped passageway that re-traced the Casbah's pre-Roman relationship with the sea, and link to the colonnades below. A new memorial wall was also proposed to commemorate the Algerian struggle with an architectural water course that linked the upper square with the sea itself. Beyond the landside design response we also proposed a radical new inhabited breakwater structure that extends the existing breakwater to create a new 'lagoon like' body of water to support an important new marina development. The opportunity to attract boaters from Northern Mediterranean resorts is huge. This new breakwater would have an urban scale gateway at its centre, a gate that would be aligned with the view corridor from the Fisherman's mosque in the Casbah's square. Symbolically the new threshold would represent the new Algiers and its 21st century ambitions. Currently the main commercial port is immediately adjacent to the site. However, this port operation is restricted and consequently there are generally 10 Ð 20 massive super tankers that sit just off shore. Basically, when it is their turn they are signalled to offload or upload cargo. These massive boats are a disincentive to leisure craft or small ferries presently. You can begin to see the scale of the challenge. Move a rail station, move the countryÕs commercial port, relocate the industrial scale fishing port, overcome the key challenges of crossing one of AlgiersÕ busiest roads without building a bypass around the city and you can see itÕs an enormous project. However, if I was to say that from the projects our Abu Dhabi client was in discussion with the Algerian Government on, that this was certainly not the largest, you then get a sense of the scale of investment that Algiers is considering. No study of Algiers is complete without considering Le Corbusiers plans for the city. We were humbled that the last architect to look at our very site was Corb. His vision was to clear the Casbah, completely erasing all evidence of it, replacing it with continuously curving and linked apartment buildings. Like the existing classical colonnades, a modernist superstructure of huge proportions was proposed. These structures would relate to the topography and terrace across the landscape to obliterate historical form. The Casbah was considered a slum, a health hazard and a social problem. Its removal was at the time an obvious solution, one that was realised in many other locations across the world. Thankfully Algiers did not progress the Corb plan, but the problems of the Casbah remain. Although perhaps one day soon parts of it can be regenerated for tourism generating some employment and pride and opening it up to the world. 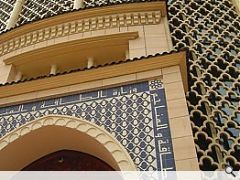 The city of Algiers including the entire Casbah area and the French Quarter is listed as a World Heritage Site by UNESCO, but even UNESCO admits much work is needed to rival it as an attraction to the likes of Barcelona. The project is still being considered by the Algerian Government. The country's emergent economic progress and its partnering with enlightened Abu Dhabi investment is still an initiative which is not immune to the Global Financial crisis. We are hoping to re-engage with the project when the worldÕs banks and regional economies improve. Our Abu Dhabi based client, Sorouh, have an excellent in-house team of academics, architects, urban planners and economists that will, we believe, want to continue to consider projects outwith the Gulf region. I believe this is one of many opportunities that exist for architects prepared to venture outwith local markets, opportunities not only for large practices but ambitious practices. We have worked alongside small, medium and large practices overseas and in emergent economic contexts. It is challenging but possible and, more than anything, an education.